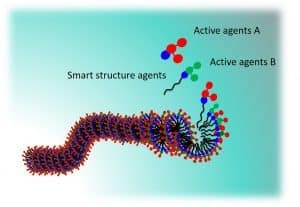 In products that include the Activifique approach, ingredients are made to form supramolecular assemblies organised in leaflets, inspired from biological systems (such as skin). These structures not only confer a soft texture but most importantly they dissolve slowly or when they receive special signals from the skin. As a consequence, unlike in standard creams, the active agents penetrate the skin at a rate that makes it possible for skin cells and layers to benefit the most from their moisturising, soothing and other activities.